The icy winds billowed against her, almost to the point of freezing her side. Thankfully, she had the warm coat of fur to protect her against such temperatures. She raised her head to the sky, her fur dancing around her face as she looked up. Sometimes, she imagined that she could see a great dragon looking down on her, seeing what the truth was behind the lies which the people spread about her. She hoped, prayed, and willed that it were true. But sometimes, she just didn't know. A figure caught Krystals' eyes as she turned towards it, unable to identify if it were friend or foe. She snarls at it, backing away and hoping beyond all hope that it didn't want to come near her as it wasn't dragon shaped at all. Sadly for her, it was a mutated predator, and it snarled a challenge at her. Taken aback for a few seconds, Krystal formed and threw it at the beast. However, luck wasn't on her side as it seemed to dodge, before tackling into her form. She snarls, using basic self defense to throw if off from her before she jumped into the sky, her rainbow colours standing out badly in the blizzard. Again, luck wasn't on her side as it grabbed her, and threw her away. Her head hit into a rock-hard, dazing her for a few moments. She shook it groggily to clear it, before clambering up the mountain. The ice bit at her scales, and threatened to freeze her claws off, but she pulled herself onto a ledge. She watched as the creature gave up the hunt and wandered away and she sighed. "Why is it that nothing nice ever happens... ever since I was thrown out bad luck just follows me." Krystal sighed, flicking her tail off the edge of the ledge to let it hang there. Icy breeze pressed onto his furry coat, but he continued on without noticing as cold never seemed to bother him unlike the heat does... 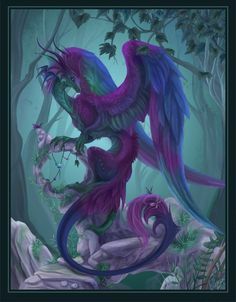 When he exited the snow forest and walked along the ledges of a mountain, the light shone more into his fur and wings giving off rainbow tints, mainly pink and green. Nothing much was happening around him as he moved on sadly. Just as when he decided to stop for something to eat, he saw a dragoness, purple in description if he wasn't colourblind. She doesn't look very happy about something and Kyuurei had a thought of going to her to cheer her up, which was a thing he doesn't usually do. As a dragon's reaction towards him are unpredictable, he slowly walked towards her, standing 12 feet in distance from her when he had finished moving. If she hadn't noticed him yet, Kyuurei spoke to the dragoness in a calm voice, trying to be as confident as possible, "Hey, are you okay?" Kyuurei awaited for her response. The large IceWing was lost in her own thoughts, the ice billowing a gale around her. Slowly, the ice flakes died down, the howling turning to a whisper as the lone female looked down to where she was almost mauled. Life must be against me... She thought rather bitterly, before shifting her paw ever so slightly to flick some of the white snow away from the edge and down from the cliff in front of her. Slowly the gale died down, replaced with the normal and bitter cold of what she had grown up in. Soon though, she was broken out from her thoughts, a voice calling out to her from among the icy coolness. She turned quickly, to face him, a bit of a cautious look in her eyes. Slowly, Krystal stood from where she was, looking somewhat down to him because of the height she was at. "Greetings, I-I'm fine, what are you doing out here in the icy cold?" She asked him, stuttering slightly as she was still a tiny bit nervous from what she had just experienced. Kyuurei relaxed a bit when she spoke to him. He answered her question before he said anything else. His voice was soft and quiet, maybe too quiet, "I am always out in the icy cold, it feels better for me to be in than places without snow." With a corcened look on his face, he doesn't think that she sounds like she was fine, probably because of the way she stammered at the beginning... Wanting to know the truth, he spoke again, his voice was quiet still, "Oooh, so are you fine? So then if you were, you should be looking less nervous. I'm not a big or scary dragon, wanting to eat you or anything like that. I think you could effortlessly crush me if I don't watch out because of how tiny I am... Well that's said, would you tell me that you are okay or not now?" He sighed, thinking that he had said too much on the second part... Oh well. Krystal noticed the slightly surprised look on his face, before looking down, rather downcast that he didn't exactly approve of her. It wasn't like this always happens before. In every single time. Every single day. She sighs, her head turning away as she does so. Krystal managed to catch his breathe from the winds and icy breezes, a smile on her face as she nods slowly. Then she gives him a really amused look. "You are an IceWing, and you don't like the snow? There is so much around here..." She asked him and comment, really rather amused. He looked like he was covered in a thick layer of fur, much like she was in order to protect against the cold terrain. His wings were made of beautiful, gleaming and soft feathers, brilliantly blue and they looked incredible to touch. However, she kept these thoughts to herself, and would satisfy her curiosity later. She also figured that they were much like her own wings, which were pulled tightly against her body to keep the cool away from her. She inclined her head, deciding to give him the answer that he sought as he seemed to be somewhat trustworthy. "Well... there are some rather unusual mutated creatures out here-I just somewhat had the pleasure of meeting one face to face. Thankfully, it was unable to climb so it didn't chase me up the walls..." She trailed off, looking back down into the abyss. "So.... what brings you to these parts?" She asked, a little nervously and untrusting, as the last male dragons she met... weren't exactly nice or kind to her. Kyuurei watched the female Icewing's head turn away from him, he felt more low-spirited than before because of this, what did he do to make her unhappy? As he was feeling sorry, he puffed his fur like a cat would do, letting at of his negative energy out. He felt a little bit more chill and happier. Kyuurei looked at the Icewing who is giving him a amused look, he shook his head for her response. When did he said he didn't like snow? How did he misword his speech? "Ay-ay, n-no. I-I meant that I grew up in the snow. For the longest time, cold temperatures never bother me, only above 20 (Celsius) does." Kyuurei raised his near-frozen wings in the air, half open or half folded. And he listened to her answer to his question. In case if she hadn't noticed, his fur were radiating snowflakes, which is hard to notice because of the snow covering the area they are in and the snowstorms seemed to hide this as well. Kyuurei blinked in curiously when she mentioned something about the mutated creature, and when she looked into the abyss. Kyuurei wanted to know what they looked like and he stared into the abyss as well, well he was sorta standing too close to the edge of the cliff as he searched for a creature she was referring to. (Which I don't know what it looked like, or how big is it...) "Boredom, a boring day in the Icewing kingdom leads me to go outside and explore!" Unless the kingdom isn't really doing anything like he thought, Kyuurei was just being naughty and he got sidetracked with exploring 'The wonders of nature.' "Well... What about you?" He asked the Female Icewing.